The island-state’s lender is raising 1 billion euros of new capital to help it pass the euro zone’s upcoming stress tests. That will also reduce the percentage of Russian investors on its share register, and help it look slightly more like a normal bank. 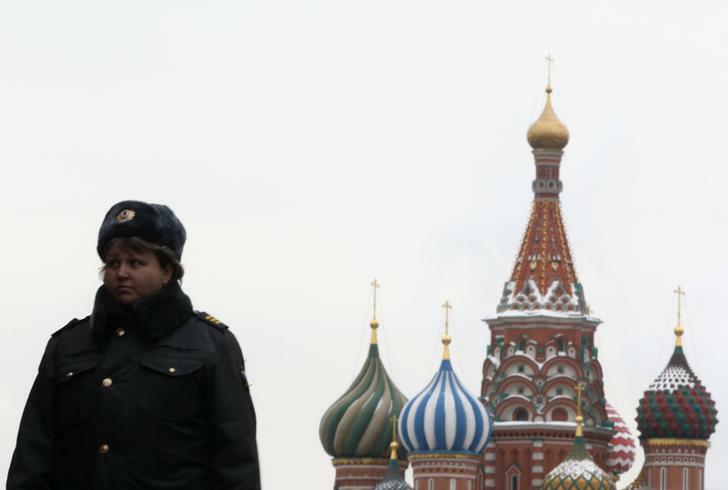 An Interior Ministry officer stands guard in Red Square, with St. Basil's Cathedral seen in the background, in central Moscow March 2, 2012. Bank of Cyprus announced on July 28 that it had raised 1 billion euros by placing 4.2 billion shares at 0.24 euros a share. The bank said that shares were allocated to institutional investors from Europe, North America and Russia, including a number of international investors introduced by Wilbur Ross and the European Bank for Reconstruction and Development. The second phase of the placing could see a clawback of up to 20 percent of the new shares created by Bank of Cyprus’ existing shareholders. The clawback offer is open for 15 days from July 31. The minimum purchase consideration per existing shareholder in phase 2 will be 100,000 euros. A third phase will allow all existing shareholders (not counting those who participated in the placing) to contribute to a separate 100 million euro capital hike. HSBC and Credit Suisse acted as lead placing agents, with Deutsche Bank and VTB Capital as co-lead placing agents.